What started out as a vague idea on a drunken night, became the epic that I ended up with here. There are loads of Star Wars edits out there. 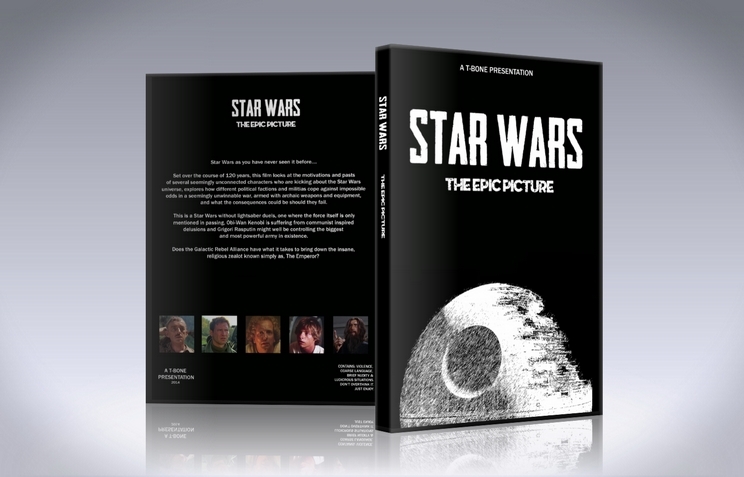 I had no desire to make a slightly different version of the actual films. Rather, I wanted to make something completely different, yet strangely familiar. To use footage and characters that we know and give them new backgrounds, motivations, relationships and futures. This is a mix that takes from a number of films and TV shows featuring various actors from the Star Wars films. An attempt to retell the story from "A New Hope", something that we are all very familiar with, and turn it around completely to make it into a whole new story. Visual: Dragonslayer, The Professionals (British TV series), Season of the Witch, Blade Runner, A Handful of Dust, Star Wars: AOTC, ROTS, ESB & ROTJ, The Clone Wars TV series plus many scenes from WW2 era archive footage. Audio: Crime and Punishment (TV miniseries) and Gorky Park for Ian Mcdiarmid lines. Added and changed music from Star Wars soundtracks, plus film score pieces from Michael Nyman, Angelo Badalamenti and Riz Ortolani, as well as some traditional and classical tunes. Aphex Twin for the ending scenes and credits. matrixgrindhouse for the early reviews and advice. - Generally too difficult to give specifics, as most of this edit is made up of joining chunks of films, though there are MANY small and large audio and visual changes throughout. - Added 30s style newsreel at the beginning instead of the usual Star Wars opening crawl. - Added new music and sound effects where needed. - Changed voices for some characters using lines from other films/TV shows. - Added subtitles for non-English speaking parts. The plot to this movie... I don't even know what it is! You have a bunch of unrelated war movies and Star Wars, then you just kind of cut them together... what? I found certain parts to make sense, funny and unexpected things happen, but still aren't well edited together. This edit seems like a "first cut" of the project, so many things need to be revisited, rearranged, and fixed! Fine, nothing noticeably bad here other than star wars deleted scene film scans but that isn't the editor's fault. Oh my... the fade-outs! The dreadful fade-outs! So many choppy cuts! Almost unbearable at some points. The movie starts off with an intensely christian Ian Mcdiarmid getting lit on fire by a demon (darth bane?). Then the movie moves on to a bunch of other world war two movies for quite a while, also every once in a while cutting back to Darth Vader for no apparent reason. The movie drags on for quite a while, then Darth Vader talks to the Emperor and has a ridiculous vision of how Christopher Lee and Ian Mcdiarmid are partners and how the emperor is deformed from being burned (refer to scene at the beginning) and how Christopher Lee had the plague but was saved by becoming Darth Vader, this montage was easily the most entertaining thing about this edit but doesn't actually serve a single purpose for the story. Many scenes in this movie just seemed straight up pointless, there's a scene where Harrison Ford and his group of soldiers try to convince a Nazi soldier that they are holding medecine (why?) and another scene where a woman bathes and then makes love to a German Soldier (whyyyy?). Halfway through the movie, A New Hope starts, and runs for pretty much the rest of the edit, this is just a shortened version of Star Wars, and actually works due to the fact that it serves a purpose. 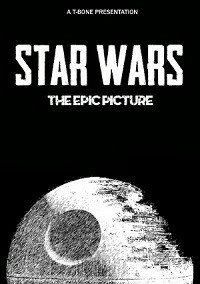 The movie ends with the death star destroying a planet while the trench run happens, then it just cuts to a bunch of previously shown characters looking sad. I don't even know what to say about this... what. a. mess. I found this to be a rather unique and quite bold fan edit. Some parts did feel disjointed in places but the overall narrative worked pretty well through I can understand why some would need a couple of viewings to really grasp the overall work fully. Some lines of dialogue could have been cut in order to better streamline the world building you where trying to do with the fanmix, mostly little gripes here and there but nothing major. Besides minor flaws here and there I personally enjoyed this more so with the mix of high tech and low tech worlds in the setting and just the idea alone of Darth Vader being a future Rasputin was enough to sell this whole thing to me hehe. It was far from perfect, there are flaws that stick out as other reviewers have mentioned but what has been created is a pretty interesting piece of work oozing with style and some thought provoking themes. !This review contains massive spoilers! So up to you if you want to read on that's your call. Most of the source material is decent looking HD but some material is jarring sub-SD. I also cannot fathom why this edit is based on the 2011 SE and not something like Harmy's DE? So yes this has a wierd pinkish hue and bizarre CGI additions. There is often the use of slow-motion but it is very jerky and unnatural looking. Some scenes featured a wierd blurring round the edges that appeared then disappeared. There are also a couple of aspect ratio problems where the image bled from scope into the 16:9 frame. e.g. Christopher Lee is still called Rasputin instead of Vader??? (So was Christopher Lee supposed to be Vader or what? It wasn't very clear) when the name could have been removed, we are forced to watch 7 seemingly unedited minutes of Kwai before Guiness even features and 20 minutes of Kwai with little or no tangible connection to Star Wars. Again the Navarone footage goes on and on and on with just Ford's presence to link it to SW at all. This edit is almost 3 HOURS LONG. You really need to justify this ammount of someone's time. At least try to make it as short as is practicle to spare the audience. But there was no attempt to make any part shorter than it could have been. This aspect of the edit made me a little angry if I'm honest. A warning: Although this should be a family friendly Star Wars edit, don't show the family as the bizarre decision has been taken to make Greedo swear several times in his subtitles (I added the *) e.g. "..and put a f*cking bolt in your brain here and now"
This bit ^ made me wonder if this was supposed to be the fanedit equivelant of 'The Room'. A fanedit so misjudged it becomes unintentionally funny. Lastly there is an obvious error in the fanedit credits at the end. Most of the audio features sudden and very harsh audio fades or no fades at all, the audio just cuts out. At points the audio was badly mis-matched to the video but I'm not sure if this was a "deliberate creative choice". Music qeues start and then stop dead, no gradual fade out or fade in, they are there and then they are not. There is almost no attempt to match the soundtracks of the added footage to the SW universe. Even a little JW music here and there would have helped. The total failure to make any effort on this front meant the sudden dubbing of blaster sounds over one scene in the middle genuinely just made me laugh. Also many SoundFXs are missing or mis-timed. The deleted ANH footage is the worst with no additional FX added to complete the largely incomplete soundtrack. Scenes follow no logic order, or character arc. Characters are bitter enemies and then quite friendly one cut later. There are many pointless minor characters that get loads of screen time for no reason. Either plot elements are introduced with no resolution, or explanations for later events are removed. If you know Star Wars I'd call the narrative incoherent, in the unlikely event you don't know Star Wars, I'd imagine it would be baffling in the extreme. First off the few highlights: The Emperor redub was a lot of fun. The new Cantina music was groovey. The ending montage was quite well done. The cutaway to the Death Star during the bridge chat was cool. That's it I think. In conclusion, this is only for Star Wars ADDICTS who have limitless reserves of patience and a high tolerance for poor editing. The ambition is Epic, but the execution is most definitely not. This is the worst fanedit I've so far watched and 3 hours of my life I won't be getting back. Again, I'm sorry for the harsh review but I'm just being honest. There were some neat special fx seeing the incomplete Death Star in the sky at one point, and I liked some things toward the end, particularly the shots of Harrison Ford and Alec Guinness looking sad. I am eager to read other reviews. I found the bookends - opening and closing - truly inspired. Scenes of walkers superimposed against WWII stock, that took my breath away. Creative idea of what an Empire invasion would resemble. The ending with the Death Star was brilliant, as well. Where I had problems were the additions of Bridge Kwai, Force Navarone, and especially Rasputin. None of those worked for me. Different tones, different looks. Like mashing country and rap. Took me right out of the narrative and I found myself impatient for them to end. Also the black out segues between scenes grew noticeable after a bit. Matrixgrindhouse gave this a nice review, which was what lured me. I can see what T-Bone was aiming for, and to be honest, he did a great job. I can also see where other viewers will enjoy this and give it raves. By all means, check this one out.